I’m writing this post in all it’s gory details to be honest that living life in fear of the reaper isn’t always easy. The toughest challenges aren’t easy, they can be quite scary and the lack of neon lights announcing ‘this is the right thing to do’ often leaves me with unanswered questions. This week, my 15th in Geneva, has been the hardest since I’ve been here. For the first time I have really questioned what it is I am doing here and wished I were back in London. I’ve felt it even more because I had such a great weekend, spent with the lovely Dawn visiting from the UK. 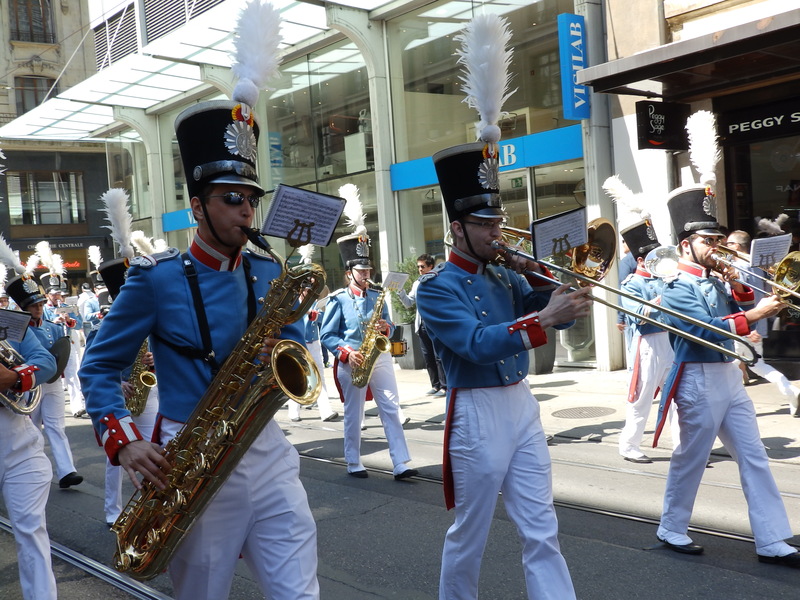 Weather was amazing and it was the 20th anniversary of Geneva’s joining the Swiss confederation. There was a parade with amazing outfits, stupendous horns, and maypole dancers. There were free concerts including yodelling, electric jazz rock and hip-hop rap with a surprisingly good beat-boxer. I felt lucky to live in this beautiful city. The downside to having spent the entire weekend outside, lounging around on the grass, enjoying the lovely spring weather was the hayfever. Sneezing constantly on Saturday and Sunday seemed funny but come Monday the joke was wearing thin. Then the toothache started, with pain so bad it would wake me up, once the pre-sleep painkillers had worn off. Generally I am not a fan of visiting The Dentist (I use capitals to make it seem sinister) but in a country where I barely speak the language and fear a visit will cost me next month’s food allowance that fear is increased somewhat. My infected tooth led to a painful swollen gland under my jaw. This was quickly followed by an outbreak of impetigo, no doubt hastened on by the excessive sneezing. The good news with the impetigo is I’ve had it before, so already have the required cream and know that it should start to ease up in a few days. The bad news is it looks like I have a snot-encrusted face, which would in fact be pleasanter (feel free to Google). I often get it when I have a cold and it brings me down every time. It’s a vanity thing. Looking like a barnacle encrusted vomitorium makes me feel bad. So I have allergies, toothache, swollen gland and the facial eruption. Add in mosquito bite aggravated eczema and a dash of diarrhoea and we’re there. I’ve only just passed my probation at work and I felt uncomfortable having to take two days off work and then a third worked from home. I assume people will think I’m faking it and contemplate innovative ways to fire me (they have to work harder now I’ve passed probation). I have been feeling incredibly sorry for myself and more so because there was no-one else here to feel sorry for me. I felt very alone in a strange city and wondered what I was doing here. In London I could see a dentist easily without spending a fortune. In London my fiancé would be there to brave the outside world for me, so I don’t have to risk making children cry when going to the shops for remedies. In London I never would have got sick in the first place (alright, that one might be pushing it)! But as the week wore on I rediscovered that people are amazing. I don’t know why I am constantly surprised when people show acts of kindness, it really happens quite a lot, but every time I am confronted with the goodness within people it awes me. Work called me on the second day of my illness, not to uncover my fraud but to see if I was alright and if they could help in anyway. My landlord encountered me in my sorry state one evening and told me to call him any time I had any problem, not just flat related. He called me up two days later just to check on me. A new friend I had to cancel drinks on asked what he could do. Little acts of human compassion made being sick in a new place not nearly so frightening or lonely as I had at first thought. And my lovely cat Jasper, the image of my blog, reminded me of something. No matter how bad you feel someone else, somewhere else is always feeling worse. Jasper had an abscess, I tried to treat him at home, but then he got another one so he had to go to the vet. He had his back leg shaved, a drain put in, multiple stitches and a plastic cone placed around his head. He has become a very forlorn looking lampshade. Poor Jasper has no idea what has happened to him and is utterly miserable. So, it could be worse. I could have been shaved, sewn up and turned into a piece of household furniture. Whilst I wait for my various ailments to heal up, and I am on the mend, I shall try to remember that you need the lows in life to really appreciate the highs. You poor thing. Feeling rough on your own without benefit of having the fevered b. mopped by one’s nearest and dearest is the pits but at least you know you have a n. and d. flying out soon – so you will appreciate him all the more !! Look after yourself and bite the bullet on seeing a doc if no better – if jasper can cope with being prodded about then so can you! Toothache are the worst thing ever! Have you seen a dentist yet? There will be a moment where you’ll feel home in Geneva in any mood or circumstances. You’ll have 2 homes, London and there. In the meantime, thinking of you. Thanks for including a picture of Jasper, and not one of you.